Liquefied natural gas (LNG) is natural gas (primarily methane) that has been liquefied by reducing its temperature to minus 260 degrees Fahrenheit. It can be compressed, stored and transported over long distances by ship; and then stored on land in specially-designed storage facilities. The liquefied gas can then be reheated, converted to vapor, and injected into a pipeline system, for distribution throughout a gas system. It can also be transported to local utility storage tanks via truck. LNG has traditionally been used for supplemental supplies, particularly for winter peak periods. It is also important in particular areas (like parts of New England) to help maintain system pressures at different points of the regional natural gas system. It is a fuel with multiple applications, from powering electric power plants to fueling heavy-duty trucks and water ferries, among other applications. LNG can help meet demand for natural gas, and provide supply flexibility to the natural gas and energy marketplace. LNG has an excellent safety record in all its facets - shipping, trucking and storage. The Northeast Gas Association (NGA) runs an annual program with the Massachusetts Firefighting Academy on LNG. The school has been in operation over 25 years, training personnel from utilities, pipelines, and local fire departments. LNG remains an important fuel for New England - providing about 28% of design day supply in the winter for local gas utilities. LNG provides about 10% of New England's total annual gas supply. There is no underground storage located in New England (geologic unsuitability.) LNG is thus an important part of the region's supply and deliverability network. There are liquefaction and satellite storage tanks in localities in the region that are owned and operated by the local distribution companies (LDCs). 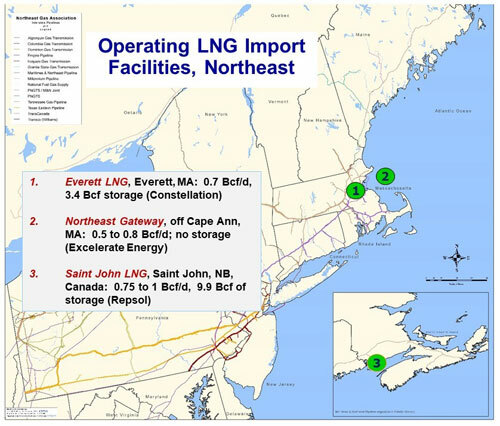 In 2018, according to NGA, the LNG storage capacity in New England among the local distribution companies (LDCs) was 16 Bcf (which does not include the storage at the Everett LNG terminal). Vaporization capacity for daily sendout by New England gas LDCs was approximately 1.4 Bcf/day; and liquefaction capability by the LDCs was 43,500 MMBtu/day. LNG is also part of the utility supply portfolios in New Jersey, downstate New York and Pennsylvania. LNG is utilized by several LDCs in New Jersey, with total state storage capacity of about 4 Bcf. One utility added liquefaction capability in 2016. LNG in New York is obtained by liquefaction of pipeline gas. Two LDCs maintain LNG peak-shaving plants. The facilities provide service area system reliability as well as assist in meeting peak day requirements. These facilities have storage capacity of approximately 3.2 Bcf, liquefaction capability of 16,800 Mcf/day, and a vaporization rate of approximately 26,100 Mcf/hr. 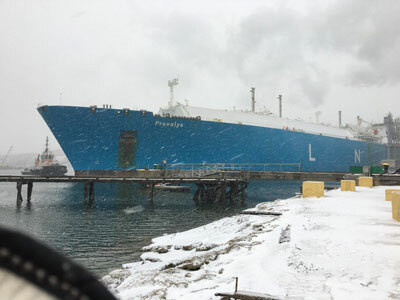 Natural gas utilities in New England own and operate LNG storage tanks as a key part of their winter supply portfolio. Total LDC LNG storage capacity is 16 Bcf. 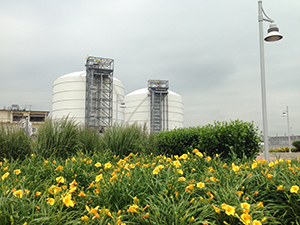 One utility in southeastern Pennsylvania uses LNG for injection into its system, with total storage capacity of about 4.25 Bcf at two plants. It receives LNG through both liquefaction and trucking. Another PA gas utility operates an LNG liquefaction plant with storage capacity of 1.25 Bcf; through a subsidiary, it provides delivery of LNG by truck to serve Mid-Atlantic and New England markets. Imports in the region (and in the U.S.) have been on the decline in recent years as U.S. domestic natural gas production has been on the increase. With its more limited pipeline infrastructure, the Northeast and especially New England, however, remain key markets for LNG. The import terminals near Boston and in New Brunswick are well-positioned to respond to market conditions if contract arrangements are in place. Everett LNG in 2018 imported 56.3 Bcf, while U.S. LNG imports totaled 71.7 Bcf (source: U.S. Department of Energy, Office of Natural Gas Import and Export Activities). 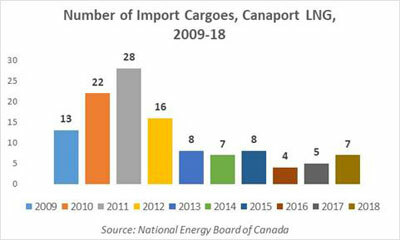 There were no LNG imports by the offshore Northeast Gateway facility in 2017 or 2018. However, the facility did bring cargoes to the region in January/February 2019 and injected volumes during cold weather periods. As in the U.S., New England LNG imports reached their highest level in recent years in 2007. New England also receives supplies from the Canaport LNG facility in Saint John, New Brunswick, Canada. The facility is located about 60 miles from the Maine border. Canaport is a joint enterprise of Repsol and Irving Oil. In 2018 it imported approximately 21 Bcf, compared to 14 Bcf in 2017. (source: National Energy Board of Canada). 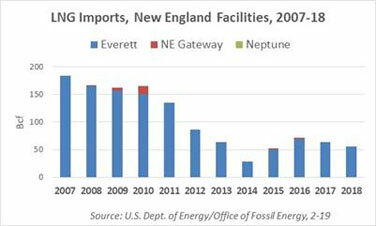 There are three import facilities in New England: the Exelon Generation, Everett LNG facility in Everett, MA; the Northeast Gateway facility offshore Cape Ann, MA; and the Neptune facility offshore Cape Ann, MA. Everett LNG, formerly known as Distrigas, is a subsidiary of Exelon Generation. Its Everett, MA facility has been in operation since 1971. It has storage of 3.4 billion cubic feet (Bcf). The terminal's maximum installed vaporization capacity is about one billion cubic feet per day; on a sustainable basis, the vaporization capacity is approximately 700 million cubic feet per day. It also has sendout capability of 100,000 MMBtu/day by truck, which supports local storage refills for local gas utilities throughout the region. The terminal is directly connected to the interstate pipeline network and to National Grid's local distribution system in the Boston area. In 2003, a nearby power plant with two units, with total nameplate capacity of about 1,500 megawatts, entered service, fueled by LNG from the terminal. Everett has received over 1,200 cargoes. In March 2018, Exelon Generation announced an agreement to purchase the LNG terminal from its longtime owner ENGIE North America, "to ensure the continued reliable supply of fuel to Mystic Units 8 and 9 while they remain operating." The transaction was finalized in fall 2018. The Northeast Gateway facility is owned and operated by Excelerate Energy. The facility began commercial operations in May 2008. Operating approximately 18 miles east of Boston in Massachusetts Bay, the offshore LNG facility is capable of injecting vaporized natural gas into the existing offshore HubLine natural gas pipeline system operated by Spectra/Enbridge. The offshore facility has varied in its levels of imports over the years. It imported several cargoes from 2008 to 2010, but no cargoes from 2011 to 2014. It brought volumes in for deliveries into the New England market in early 2015 and early 2016, during the high-demand peak winter months; but then no cargoes in 2017 or 2018. It provided volumes in early 2019 during several high demand cold weather days. The Neptune LNG facility was developed in 2010 by ENGIE, which also operated Distrigas at that time. The facility is located approximately 10 miles off the coast of Gloucester, MA. The Neptune port consists of a buoy system where LNG vessels could moor and discharge natural gas by using onboard vaporization equipment. It is capable of injecting about 0.4 Bcf per day of gas into the pipeline system from a special regasification system on-board its delivery vessels. However, it has not been active since its start-up and it is currently not operative. In June 2009, the Canaport LNG terminal in Saint John, New Brunswick, Canada began operation. It was developed by Repsol and Irving Oil. It has 3 storage tanks; each tank can hold 3.3 Bcf. It is capable of moving on average over 700 million cubic feet per day into the Brunswick Pipeline and then the Maritimes & Northeast Pipeline for delivery into Maine and New England. Its markets are in the Maritimes, New England and the Northeast. Since its inception, it has introduced over 400 Bcf into the market. With the strong rise in U.S. domestic production, there is now interest in developing LNG export facilities in the U.S., in many cases reversing the flow of existing import facilities. A number of companies have filed with the federal government for export licenses. Canada is also considering export facilities, with projects most likely advancing on its West Coast. Dominion recently repurposed its Cove Point facility in Maryland, long an import facility, into an export facility. It commissioned its first export cargo in March 2018. U.S. EIA noted on March 8, 2018 that: "Cove Point has a design capacity to liquefy up to 0.75 billion cubic feet per day (Bcf/d) of natural gas. The natural gas is sourced from the high-producing Marcellus and Utica shale plays. 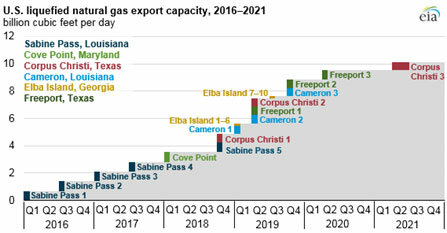 Cove Point is the only LNG export facility on the east coast of the United States and the second export facility operating in the Lower 48 states after Sabine Pass in Louisiana, which began commercial operations in 2016." The extent of U.S. exports is uncertain as the amount of liquefaction capacity globally has been rapidly increasing in recent years, from countries such as Australia. The U.S. Department of Energy maintains a list of export facility project applications; the list is posted online (http://energy.gov/fe/downloads/summary-lng-export-applications-lower-48-states). In 2018, the U.S. exported just over 1,000 Bcf (or 1 Tcf) of LNG by vessel (compared to imports of 71.7 Bcf). The level of U.S. exports is expected to rise further in coming years as more facilities come online. A relatively new development is the introduction of portable or mobile LNG and CNG (compressed natural gas) to bring natural gas to industries and businesses not located near a pipeline system or within a distribution service area. Some areas and businesses in northern New England and New York, for instance, not connected to local gas systems, are opting for gas (LNG or CNG) delivered by truck to meet energy needs. The gas is transported via a trailer that also can serve to offload the gas into the facility. This is currently being utilized to serve paper mills, farms and other entities. The value of natural gas is also leading some companies with vehicle fleets to consider CNG and also LNG as a transport fuel. LNG is of greatest interest for heavy-duty trucks that travel long distances. In Canada, Gaz Métro introduced the "Blue Highway" concept, adding LNG fueling infrastructure from Québec City to Toronto. Distrigas has added LNG fueling at its Everett facility. In 2012, ANGA released a study on LNG as a transportation fuel. It notes: "LNG has higher energy density than CNG and thus offers significant potential in NGV market segments where long vehicle ranges are required. Because LNG must be stored at extremely low temperatures, the tanks required to maintain these temperatures on vehicles are large. As such, LNG is most appropriate for heavy-duty vehicles, which can accommodate the volume needed for LNG storage." LNG is also suitable for fueling of marine transport-such as water ferries-and rail. A map of the operating facilities is shown here.